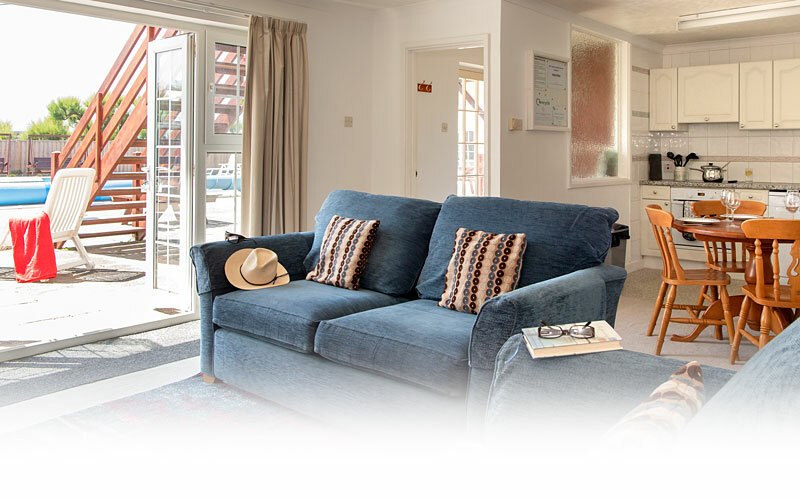 Standard Vazon Bay Self Catering Apartments | Guernsey Tourism three Star. Vazon Bay has ten standard self catering apartments ideally positioned around the large heated swimming pool. Loungers and table/seating are a step outside your patio door, just perfect for al fresco dining. Each of these Guernsey Tourism graded three star self catering apartments provide one double bedroom, one twin bedded room and a sofa bed in the lounge area in a choice of configurations: ground floor, first floor or split over ground and first floors. The "Standard" apartments have a spacious, open plan, lounge, kitchen and dining area. The family bathroom has a thermostatically controlled, power shower over bath. and the kitchens are equipped with dishwashers and microwave ovens in addition to the usual appliances. Satellite TV, WiFi internet, electricity and heating are included in the tariff. Direct dial telephone is also available.